“2013 Silver Winner Golden Piwa Awards" BEST IN LOCATION! 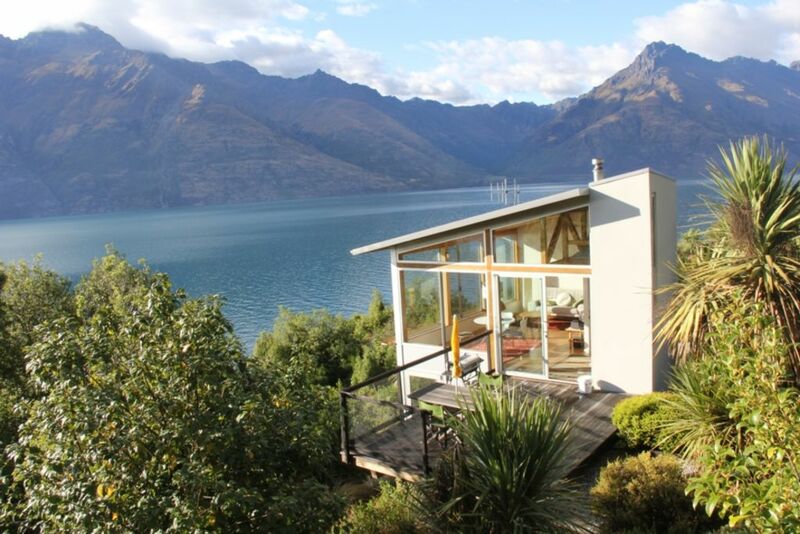 The Lakeside Maisonette is an idyllic holiday home secluded amongst native bush on the shores of Lake Wakatipu with magnificent views across the lake to the Remarkables, Cecil Peak, and Walter Peak. The property borders a Department of Conservation reserve, and there is a walking track along the lake shore immediately below the Maisonette. Although it is only 6 km from Queenstown, the setting is beautiful and peaceful. You can hear the waves lapping on the lake shore. The architecturally designed Maisonette is self-contained. Upstairs are a large living area with a small kitchen and a mezzanine platform. There is a wood burner for heating and the main window has a fly screen. A north-facing deck opens out from the living area. Downstairs are a bedroom with a queen sized bed and a bathroom with a washing machine. There is a heat pump in the bedroom and a fly screen on the bedroom window. The house is perfect for a couple and is very popular as a honeymoon destination. There is parking adjacent to the house. There is WiFi via a mobile Hotspot and this is user pays. There is no public transport to this location. I take bookings up to 6 months in advance. There is a three night minimum stay, although a 2 night stay may be available - a small additional fee would be charged. I am happy to offer early check in and late check out at no additional cost if my other bookings permit. The house is perfect for a couple. *****Please note: as there is no telephone line to the house, it is too far from us for a booster and the wiring does not allow netgeat, Wifi is via a mobile Hotspot which is prepaid ie guests pay for their usage. If you are not happy with this arrangement, please do not book the house. There is a heat pump in the downstairs bedroom. There is a woodburner upstairs, a heat pump downstairs and a fan heater in the bathroom. Coffee plunger - please bring your own coffee. Tea, instant coffee, hot chocolate, sugar, salt, pepper, oil, balsamic vinegar, tomato sauce. The house is set up for cooking simple meals for two people with saucepans, one fry pan, mixing bowl, grater, cutlery, crockery and a few other bits and pieces. Perfectly designed to capture the views from the location. Really no need for the television, as you can just watch the constantly changing pattern of light on the surrounding hills and listen to the wash of the wind on the lake. Comfortable house and a great location away from the town but close enough if you need something. The perfect place to appreciate the magnificence of Queenstown's scenery in the comfort of simple and elegant lodgings. Had a lovely stay in this very private house. Amazing views, would definitely recommend this property for anyone wanting a private and quiet space. The cottage is perfect for two and a great base to explore the Queenstown area. We spent 4 nights and enjoyed the secluded feeling while being close enough to town. The views are just beautiful and the pictures can't show how beautiful it is in person. The reasons we did not give the cottage 5 stars is that I like to cook our meals rather than eat out and I found that while I could manage to make do, the cooking facilities and wares were a bit less than I'd like. The outdoor grill needs to be replaced as well. We found that the cottage does not have any shades or blinds (other than a light filtering shade in the bedroom which does not allow for a dark room to sleep in when the sun rises at 5am) so if your looking to cut the amount of sun shining in you cannot, making the upstairs very hot (there is only air conditioning in the bedroom), you cannot keep all of the windows and doors open for ventilation because there are not screens on all the windows (bugs). I want to stress that we had a wonderful time and very much enjoyed ourselves here, these are just things I think in my opinion would make this property even better. The most amazing wee place to stay in Queenstown! We spent three nights here and it was not nearly enough time, the views from the house were spectacular, you could sit staring at it all day. We got married whilst here and had our ceremony on the jetty just in front of the house, it was so beautiful, could not have asked for anywhere more romantic. It isn’t too far out of the town and has lots of walking tracks near by, one goes from right in front of the house. Would buy this place if it was for sale! !